By default, each drum sample that you drop into Ableton’s Drum Rack has a velocity of zero, a release of 50ms and six voices. Changing these settings every time you add a sample can get tedious to say the least. To configure Drum Rack to use your preferred settings, set them in an empty Simpler, then configure the Simpler as the default for the Drum Rack. Load up an empty Simpler onto a new track. Turn up the “Vel” control; I usually set it to 80%, but you can go all the way up to 100% if you want more velocity sensitivity. Turn the “Release” knob all the way up; this means that every time you trigger the sample, it will play all the way to the end — no matter what length the triggering note is. Set any other parameters that you always use in Drum Rack (SoS suggests also turning “Voices” down to 1). Open the Library in Ableton’s file browser, then expand the Defaults folder. 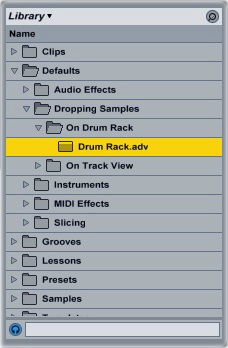 Open the Dropping Samples folder, then expand “On Drum Rack.” Drag and drop the Simpler that you configured into this folder. Rename the Simpler to “Drum Rack” (click “OK” if Ableton ask you if you want to replace the default preset). Now, when you drop a sample into Drum Rack, it will automatically have the configuration that you set up.